Apple’s Mobile Safari browser doesn’t current support extensions or add-ons, so there isn’t currently a native Evernote Web Clipper for this browser. There are, however, a couple of other ways to clip content into your Evernote account using your iPhone, iPod Touch or iPad. Note, though, that these are workarounds and are not officially supported. 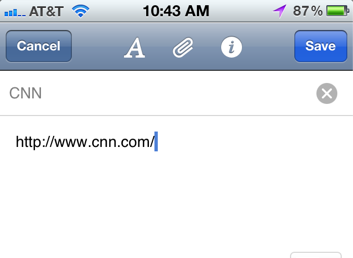 Create a new bookmark in Moble Safari by tapping the action button, then Add Bookmark. 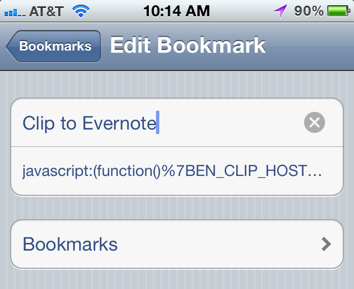 Change the name of the bookmark to “Clip to Evernote”, then press Save. Visit this page in Mobile Safari and copy all of the text. 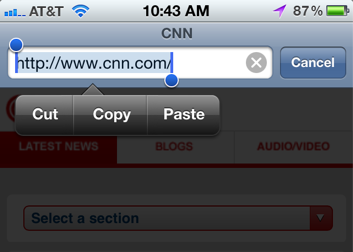 Tap Done and, from now on, you can tap the Clip to Evernote bookmark in Mobile Safari to clip the current web page. 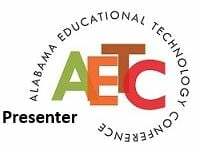 Note that you’ll still need to login with your Evernote account and the various fields and controls in the clipper aren’t optimized for a mobile browser screen. Clipping using the Evernote app is another common workaround. Here’s how to do it.